Houston will become “ …beyond all doubt, the great interior commercial emporium of Texas.” Thus bragged the Allen brothers in an August 1836 advertisement. 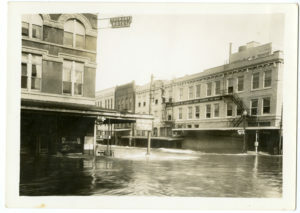 Thirteen months later rains from a hurricane in September 1837 flooded the city’s Main Street to a depth of four feet. 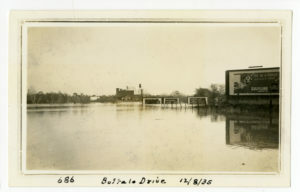 This inundation did not deter the city from its predicted destiny – nor did any of the storms and floods that followed. The Weather Research Center, part of the John C. Freeman Weather Museum, lists just shy of 100 significant Houston area floods between 1837 and 1989. Nevertheless, people continue to move to the Bayou City. Whether through resilience or stubbornness, Houston is here to stay. Houston photographers have chronicled some of the significant storms the city has endured and some of those photos have made their way into collections housed at the Houston Public Library’s Houston Metropolitan Research Center. These images give perspective to Houston’s latest flooding. Water-born grief is not new; it has woven itself into the fabric of Houston’s history from the 1929 and 1935 floods that spurred creation of Addicks and Barker reservoirs to the government-censored hurricane of 1943 that interrupted wartime production to 1961’s Hurricane Carla that saw the City Auditorium pressed into service as a shelter. Houston reacts, recovers and rebuilds. Joel Draut has worked with the photographic archives at the Houston Metropolitan Research Center since 1998. He worked as a photographer at the Houston Post from 1977 until it was closed in 1995.